By the late 1800's advances in electrical theory were providing the foundation for the development of many new technologies including electric motors, trolleys and lights. In large urban areas like New York City electric street lamps were starting to appear, and even home lighting was beginning to be available to those wealthy enough to afford it. One of the many other tasks inventors were seeking to accomplish was that of using electricity to make stringed instruments louder. By the 1920's and 1930's the advent of Big Band and Swing music like that of Benny Goodman and Glen Miller, along with the increasing popularity of public dances led to a clear need for louder guitars, even the introduction of steel strings was designed to increase the volume of the acoustic guitar. Simultaneously a new style of slide guitar playing began to appear in Country-Blues music utilizing a Hawaiian style guitar. The Hawaiian guitar is the forerunner of the modern pedal steel guitar, it is a flat instrument with between 6 and 8 strings that is played while resting on the players lap, and unfortunately these flat guitars had little resonance and could barely be heard when playing with other instruments. During this time two Los Angeles musicians George Beauchamp and John Dopyera began trying to find ways of creating louder guitars. After some failures Dopyera came up with the idea of using aluminum disks in conjunction with a metal body. They found that this made a guitar that was 3 to 5 times louder than a traditional acoustic guitar and had a sound that lent itself ideally to slide guitar style playing. In 1927 Beauchamp and Dopyra formed National String Instrument Co., which patented the new resonator design. The resonator made by National quickly became popular among Country and Blues slide guitar players but due to internal problems between Beauchamp and Dopyeara in 1930 Beauchamp was fired from the National String Instrument Company. At a later date the company was sold and Dopyera began to produce the resonator under the name of the new company he founded with his brother "Dobro". In 1930 after being fired by National George Beauchamp began looking for new ways to increase the volume of the guitar. It was common knowledge by this time that passing a wire through a magnetic field produced a change in magnetic field intensity which in turn could be used to create a changing electric current in a properly coupled coil of wire. This same principal was the basis for electric motors, generators, phonograph needles, acoustical speakers, and many of the other products being developed and marketed at this time. As early as 1925 Beauchump had been experimenting by using phonograph needles to produce a single string electric guitar on a piece of two by four and believed that if a device could be developed which could "pick up" the vibrations of each individual string, and convert those vibrations into a proportional variation in electrical current, then that changing current could be amplified by one of the tube type amplifiers used typically in the PA and Radio systems of the day. After many months of trial and error with most of the experiments conducted on his dining room table Beauchamp, along with Paul Barth developed a working "pickup" out of two horseshoe magnets and six pole pieces. The guitar strings passed through the magnets with each pole located so as to concentrate an independent magnetic field over each string. They wound the coil with the motor from Beauchamps washing machine, and according to Barth they ended up winding the coil with a sewing machine motor. 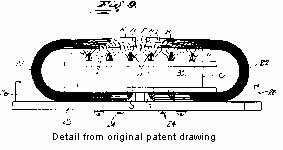 A detail drawing from the original patent drawing submitted by Beauchamp is shown below. With prototype in hand Beauchamp approached Adolph Rickenbacher, Rickenbacker a cousin of WWI flying ace Eddie Rickenbacker owned a local tool and die company and had been associated with Beauchamp at National, manufacturing the metal bodies for the Resonators. Utilizing Rickenbackers influence and financial assistance they formed a company and after several name changes they decided to call the instruments Rickenbackers due to the familiarity of the Rickenbacker name and difficulty in pronouncing Beauchamp (pronounced Beechum). 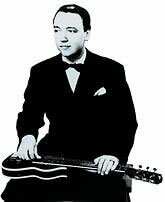 They began manufacturing the "Frying Pan" which immediately became popular as a Hawaiian lap style slide guitar and set the Rickenbaker company on its historical path of becoming the first manufacturer of electric guitars. Below are photographs of Rickenbacker and Beauchamp alongside the first fully manufactured electric guitar the "Frying Pan"
Probably the first man to build and market an electric "Spanish" style guitar was Lloyd Loar. Loar was an acoustical engineer for Gibson, and legendary for his contributions to the design and development of the mandolin. Loar had also been experimenting with the electrical amplification of the guitar since the early 1920's, and in 1933 created a new company Vivi-Tone as an independent subdivision of Gibson. Vivi-Tone was dedicated to the production of one thing, Spanish style electric guitars. Vivi-Tone aggressively marketed the electric Spanish guitar but with little success. The design was poor, and there was not yet a sufficient market to sustain a small company whose only product was a Spanish style electric guitar. Within a year Vivi-Tone failed, but the internal seeds had been planted at Gibson, the electric Spanish was the future of the guitar and the failed Vivi-Tone would go on to inspire Gibson to create the electric guitar that would revolutionize the instrument, the ES-150. In 1935 Gibson commissioned Alvino Rey, a prominent slide guitarist of the era to assist in the development of a new guitar pickup. The prototype was developed by Rey, in conjunction with engineers at the Lyon & Healy company of Chicago and the final version was built by Gibson employee Walter Fuller. The pickup was initially incorporated on a lap steel model in late 1935, but shortly thereafter was introduced onto a standard f-hole archtop guitar and designated the ES-150, (ES for Electro Spanish, 150 the price in dollars). The first one was shipped from Kalamazoo Michigan on May 20,1936. The first modern electric guitar had been born, guitar history was being made. The ES-150 became an instant success, guitar players from all over the country and from every style flocked to purchase one, most noteable among them was Charlie Christian who took advantage of the increased volume of the instrument and began to use the guitar as a Jazz soloist in the same way that only a horn player previously could have. His performances with the Benny Goodman Orchestra ultimately revolutionized the way all musicians thought about the guitar. 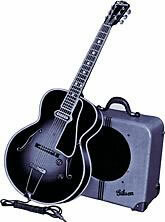 To this day the ES-150 is known as the "Charlie Christian" model. Even with the great success that the ES-150 had it still exhibited some less than ideal characteristics. The hollow body vibrations could be picked up and amplified, in addition there were problems with feedback, distoration, and undesirable overtones. Prominant jazz guitarist and inventor Les Paul believed that the solution was to introduce a solid body electric guitar, and his first succesfull attempt at eliminating these problems was affectionately dubbed "the log". It consisted of two simple magnetic pickups constructed by Paul, and mounted on a 4"x4" piece of pine. To give " the log" the appearance of a guitar Paul glued two cutaway halves of a hollow body guitar to the 4"x4". The result was a fine sounding jazz guitar without feedback or unwanted overtones, in 1946 Les Paul took his new solid body guitar to Gibson. Gibson was less than enthusiastic about the prospects of a solid body guitar, convinced that consumers would not accept it. All previous attempts to introduce a solid body guitar had failed, but one man however, Leo Fender, believed that solid body guitars held the future of the guitar market. Fender, who owned a radio repair shop in Anaheim had built a prototype solid body guitar made out of oak in 1943 which he rented out to musicians in order to get suggestions from them. In 1949 Fender released what would become the first succesful solid body guitar the "Esquire", later renamed the "Broadcaster", and ultimately the "Telecaster". Fender's solid body guitar had all the advantages of Paul's, long sustain, and no feedback or unwanted harmaonics but it never quite caught on with jazz guitarists. Jazz guitarists prefered the rounder more mellow and even somewhat more accoustic sound of the Gibson ES-150, but the Telecaster became extremely popular with country, blues, and later on in the 1950's and 1960's rock and roll musicians. It's more trebly and truely "electric" sound made it the first great rock and roll guitar. Based on the success of the Fender solid body guitars Gibson took a second look at Les Paul's solid body design and in 1952 decided to build a solid body guitar that would become the industry standard. Although the inspiration for the Gibson guitar came from Les Paul and was ultimately named after him, the design for the solid body guitar actually came from the companies new president Ted McCarty, and more closely resembled 1800's model Gibsons than the ES-150. The pickups were P-90's, originally developed in 1946 they had a warm, mellow sound and were very versitile. These original Les Pauls are some of the most highly sought after guitars on the market today and regularly sell for many thousands of dollars. Ted McCarty The Original "Les Paul"
By 1961 the electric guitar was in it's full maturity. Gibson had introduced "Humbucking" pickups into the Les paul, designed to eliminate unwanted hum from the magnetic coils Humbucking pickups utilized two coils wrapped out of phase so as to cancel out the common mode hum introduced by previous designs. Around 1961 Ted McCarty introduced the ES-335, a semi-hollow body guitar designed to incorporate the best of both the hollow body, and solid body designs. It quickly became popular and used by such influential guitarists as B.B. King and Chuck Berry. Both Gibson and Fender had introduced futurisic looking designs, the Gibson SG (solid guitar) and the Fender Stratocaster both became standard guitars for rock artists in the 1960's with the Stratocaster reaching it's peak by becoming the guitar of choice used by Jimi Hendrix. Hendrix was the first guitarist since Charlie Christian to completely revolutionize the way the guitar was played. Although there have been a handful of other manufacturers in addition to Gibson and Fender such as The Fred Gretch Co. formed in Brooklyn in 1883, who have contributed to the development of the electric guitar, the electric guitar as it exists today is for all practical purposes the same now as it was by 1961. A few newer companies such as Ibanez, and B.C. Rich have been able to attain some succes in the market mostly with younger players interested in Heavy Metal music but even now the overwhelming majority of electric guitars sold in the modern market are either a Fender or a Gibson. Older models have attained valuable collectors status in some cases being sold for as much as 70,000 to 80,000 dollars.